It’s the month of February – meaning the month of Valentine’s Day, and thus the month of love. What suits better than a true story of love from us at Tesoro? This story is about companionship, about devotion, and indeed about true love. It’s a story ultimately about how the Tesoro saga started, many years ago. It all began near the beautiful country town called Lucca in Tuscany, Italy. His name was Francesco, and her name was Rina. They met when they were only teenagers and instantly fell passionately in love. They truly adored one another and were high-school sweethearts for many years, barely leaving each other’s side. They later went on to marry in stunning surroundings and initially lived a quiet and pleasant life in the beautiful region of Tuscany. However, their peaceful, newlywed life wouldn’t last long. Francesco was soon drafted for World War II and left in a haste, with Rina staying behind in Italy. Not a day would pass without her longing for Francesco and pleading he would come back to her, hoping he was alive and anxiously praying for his safe return. Francesco managed to survive the war, but not without many dangerous twists and turns. At one point he was captured by the enemy and became a prisoner of war, struggling every day to survive. But, he always had Rina on his mind and knew he would do whatever it would take to get back and hold her in his arms once again. Rina also remained strong back in Italy and never faltered in her faith that he would return. And one magical day so he did, 3 long, hard years later. Their reunion was extraordinary with endless smiles and happiness. Together once again, at last! Their love for each other never faltered and is what kept them both so devoted despite all their challenges. Finally their life was peaceful once again, in the picturesque hills of Italy. They went on to have a son, our father Enzo. Complications in birth meant Enzo would be their only child, and they loved and adored him beyond words. He was their everything, and they wanted to give him everything he ever needed. But as the years went by and Enzo grew older they realised their small Italian town would never provide the opportunities which Enzo deserved. They had to make the difficult decision to separate the family again, in search for a more prosperous life. Francesco left Italy in order to create a new home and future for the family in a country far, far away: Australia. Rina was once again without her beloved, and this time she wasn’t alone – she also had their son Enzo to care for. It was a challenging time, raising a small child on her own, but she gave her everything to looking after Enzo and despite how much she missed Francesco, she stood strong and supported him and his venture so that he could do what was needed to start a better life for them. Finally, a year and a half later Francesco had established a stabile base in Australia and was able to send for his wife and son to join him. They were so happy and grateful to be together again at last, despite their new life being anything but easy. Not only did they need to adjust to a new way of life and completely different culture, they also had to try to master a new language they had never spoken before. But in true Francesco and Rina style, they never gave up and they managed to create a prosperous life in Australia, eventually establishing Tesoro – and making it what it is today. Indeed – married for over 60 years, Francesco and Rino as always stood strong together and never lost faith in their love, and they never lost faith in each other. 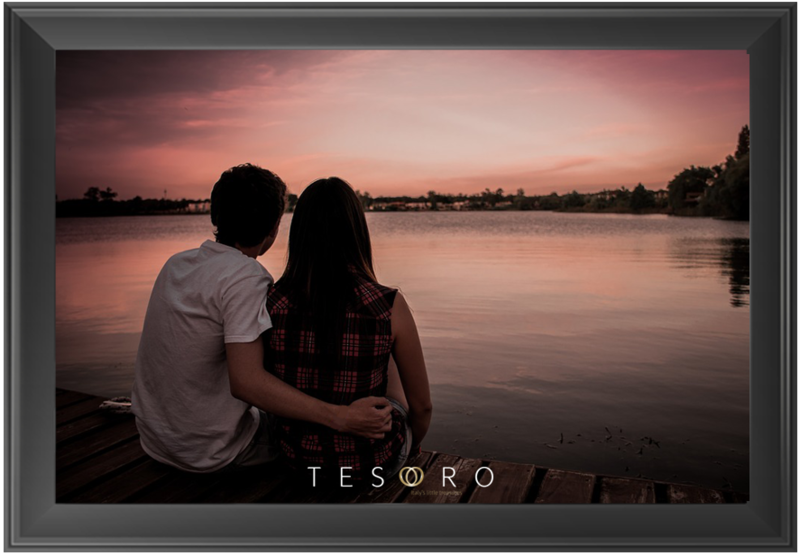 That is the love story of Tesoro, the foundation that Tesoro is built on, and what we are all about: Love. Love for our family, love for our jewellery – love for making others feel beautiful. Love – in its purest, most genuine form.